out of range for your income. There are various complexities that determine the payments, as different kinds of things can be included - such as property taxes or insurance. Some tools can even help to determine the total costs of a loan with these extras. Since you are finding out in advance what the payments will be, these tools will help in deciding which home or how much home you can buy. There is little point in looking for a home that is too expensive, getting your heart set on it, and then finding out you can't afford the payments. 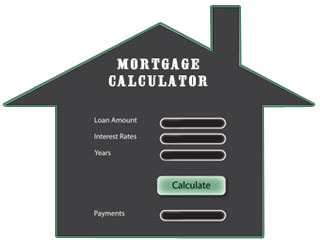 There are many online websites that offer you free usage of mortgage calculators. Before you select any particular calculator, you should check the authenticity of the website. The different kinds of mortgage calculators include: a monthly payment calculator, cost calculator, amortization calculator, fixed rate, adjustable rate, interest-only mortgage calculators, and so on. The cost calculator helps you in finding the entire cost of financing a certain amount. The monthly payment calculator, on the other hand, shows the monthly payment required for an amount financed. With this, you will know in advance just how big of sales price you can afford. The amortization calculator helps you in understanding how your monthly payments decrease the balance and what you will owe at any particular time during the span of the mortgage. It gives you the details as to how much is applied toward the principal amount and the interest on the mortgage. If you can afford to pay extra on the principal, it can save a lot of money to do so early in the loan. An interest-only calculator shows what a bank would require you to pay in (usually) quarterly interest on an interest-only loan. Adjustable rate mortgage calculators show the payments required when the interest rate changes during the term of the loan. Qualifications to finance a home, and especially vacation homes in Myrtle Beach, are very strict these days. A Realtor is going to ask you to pre-qualify for a mortgage before you begin your search for property to buy. Although banks will have specific rules as to your income versus debt ratio, it's always helpful to use a mortgage calculator even before you apply, just to get an idea of what you may be able to afford. If you have questions about financing Myrtle Beach real estate, please feel free to contact us. We'll be glad to give you tips on the do's and don'ts of keeping your credit score as high as possible - which in turn will keep your interest rate low and allow you to buy a bigger and better home or condo.